Okay, so like, an IF branch in a stored proc can be helpful to control logic, but not to control performance. That’s the most important line in the blog post, now lemme show you why. Let’s say for our proc, we want to use a different plan for different TOPs, and our tipping point is 10,000. That’s the tip of our top, if you will. And you will, because my name’s on the blog, pal. This goes quite poorly. If we just get estimated plans, here’s that they produce. Why are there two with the same plan? Why is this the same thing? The optimizer explores both paths, and the plan cache concurs. If you were to run it with the higher value first, you’d see the same thing for the parallel plans. For a lot more information and examples, check out this Stack Exchange Q&A. 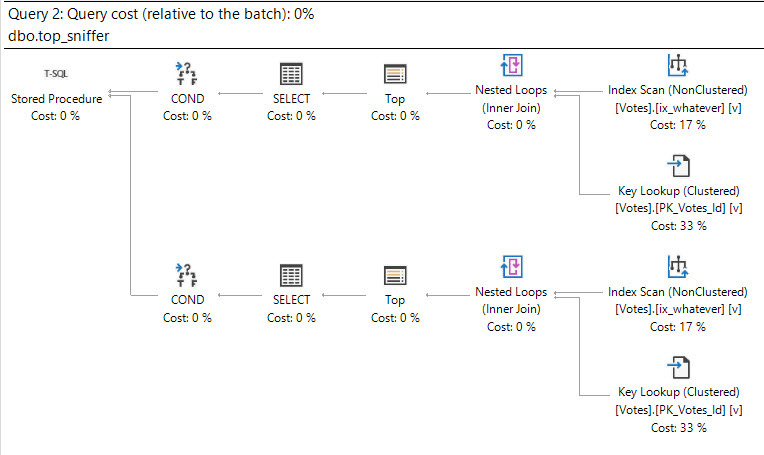 a) adding option (recompile) to the expensive part, and ensure the non-expensive plan is loaded when restarting SQL Server. Dynamic SQL may also work. 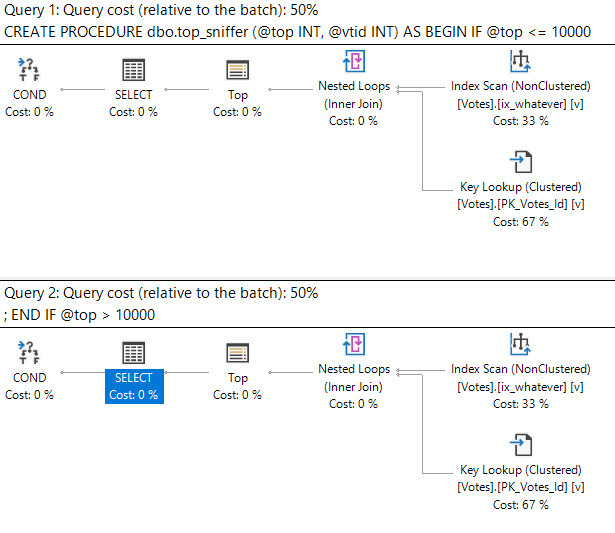 I don’t have access to a SQL server from my iPhone at home, but what about using OPTION (OPTIMIZE FOR (@top = 100)) in one query and a far greater value in the second? Not sure if I got that syntax correct. Toby — yep, you can do that if you know generally safe numbers to throw in there. Adding a local variable, while not particularly advisable, e.g. declare @big int = @top, and using @big for the 2nd block seems to shake things up. John — IIRC, using a local variable in top gives you a flat guess of 100. Is that what you saw? Indeed, that was a lead balloon. Apart from the previous suggestions, then, I’d throw in the towel on IF, affirming the point of this article, and just set the @top filter as predicate in respective UNION blocks. I got correct row estimates and the plus-sized @top got a parallel plan that way. Hi John — yeah, sounds about right 🙂 Great observations!